One Man. One guitar. No Prisoners. Someone refurbished a toilet and called it The Coconut Teaszer. Someone else painted it throbbing purple (or screaming lilac), and if it weren’t for the mid-80s explosion of Rock and Metal and Bouffant ‘do’s, the Teaszer probably would have met its justifiable end as a high-rent ghetto apartment complex, being unjustifiably in the heart of West Hollywood an’ all. And within this water closet, seemingly underground in a Gollum-esque cellar – is The Crooked Bar, a venue which advertises its stage capacity as “5,” failing to mention that they mean five hamsters on a Kate Moss diet of berries and water. As I pondered the relationship between cash and toilets, wondering just how these burning candles in here were allowed to stay lit, Garrison White came quietly on. And decisively started doing what the fire marshals couldn’t – bring the house down. Armed with six- and twelve-string guitars and a musical background which spans cultures as diverse as Russian, Israeli, Yugoslavian and Armenian, Garrison was in fine form amidst the weirdest of cultures – Los Angelenos. Although I am fully aware that audience enjoyment does not necessarily correlate with the worth of an artist or performer, somehow tonight the planets seemed to have a semblance of order and everything deservedly clicked for the ultra-talented White, the crowd warming to him after the first two songs. This same audience condoned the previous act’s soporific drivel (there’s only so far those alfalfa-munching art-hippies can take their wailing and gnashing of teeth before it becomes nauseous) so it was an achievement for Garrison to capture their rapture so conclusively. Because he has been beating the solo acoustic boards for so long, Garrison has created a unique niche for himself in the underground scene. He was more or less corralled into this niche when, in the 80s, only smaller Irish pubs would accept a solo acoustic guitarist, despite his diversity and repertoire. So onto those stages he leapt, bringing forth fire from his guitar (no, not exactly like Ace Frehley) to tame the drunken beasts before him – Irish folk and popular acoustic material became his mainstay. Then the levee broke (as Mr. Plant predicted it would) and the venues came a-bangin’ at Mr. White’s door. His material encroached into the rock genre and from that variety of musical blends he has emerged today; rock-pop-folk-thunder-speed and kick all those ninnies off who aren’t hanging on for dear life. Stephen King once wrote, “It is the tale, not he who tells it.” I beg to differ. Have you ever been told a joke by someone just Not Funny and then been told the same joke by someone else who put you in stitches? Verily, “it is not the tale, but he who tells it.” Garrison plays and sings songs with an acoustic guitar, but so do a million other guys – it is the way he transforms these songs into gems of twelve-string virtuosity that makes us heed how Garrison – and Garrison alone – tells his tales. 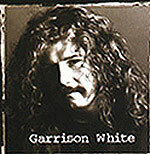 Garrison White possesses that individualism that every artist strives for and few achieve. These songs in the hands of a lesser artist would not tell the tale so passionately, so powerfully, so perfectly. by Jon Dunmore © 4 May 1995. CD available on Kinkajou Records. July 2014: This review was written in 1995 for an agency, and posted online in 2006, on TheDunmore.com website, long before I knew of Garrison’s demise (in 2003). I only posted it as portfolio material, but I’m glad I did. Unintentionally, it had become a eulogy, a small contribution to a great man. His partner contacted me mid-2006, having come upon this review out of the blue, and informed me of Garrison’s tragedy – a fatal car accident in Malibu – and thanked me for my kind words. My pleasure – especially when it’s all 100% true. Unfortunately, there is no record of Garrison White on YouTube. Instead of embedding an irrelevant video, I have chosen to leave this page void of YouTube. It saddens me that I only saw Garrison perform a couple of times, forever promising myself that I should go out and experience his force of nature again, but you know how procrastination works – we all think we’re immortal… By leaving his music with us, Garrison is.